I mentioned in my last review that smashed-and-griddled burgers are a dime a dozen in Toronto. On one hand, that’s a bummer — there so many other varieties of hamburger, but you’d basically never know it judging by the city’s burger joints. On the other hand, there are a bunch of really great choices out there for a smashed burger. Which means we no longer have to settle for anything less than great. This definitely wasn’t the case a few years ago. If you look at my very first review, for Johnny Rockets back in 2011 (which no longer exists in Ontario outside of a location in Windsor), you’ll notice that I cut it a lot of slack — this style of burger was still something of a rarity in the city. Today, on the other hand? If you’re serving a smashed-and-griddled burger: be great or GTFO. Burgers n’ Fries Forever is not great. I got the BFF2, which is a double cheeseburger that comes topped with lettuce, tomato, red onion, beef bacon, and BFF sauce. Though the patty actually looks really impressive, with a nice amount of crust, it has a bunch of issues that hold it back from being much better than okay. The biggest problem is the texture: the grind is way too fine and it’s too tightly packed. You can tell just by looking at it. If the cross-section of a burger patty is a uniform slab of gray, you know you’ve got problems. A burger should have crags and crannies. It should have texture. If it’s basically just one monolithic slab of beef that’s trying its best to re-form into a steak, it’s going to be a bummer to eat. It’s going to be tough. And yes, it was tough. It was vaguely juicy, but it was still a tough chew. The flavour was okay, at least, if nothing particularly special. The toppings were a bit of an issue, too. The cheese was cheddar rather than American; that’s not my favourite (I find it a bit too overwhelming), but that’s more of a personal preference thing. Your mileage my vary. It was nice and gooey, so no complaints there. The beef bacon was iffy. I don’t have anything against this variety of bacon (in fact, the best burger I’ve had recently featured beef bacon), but the stuff here was chewy and tough to bite through. The BFF sauce was lost among the burger’s other flavours. I couldn’t even tell you what it tasted like. Everything else was fine, including the sweet, fluffy bun. As for the fries, they were the clear highlight. They were perfectly cooked, with an addictive crispy/creamy contrast and a really great flavour. The combo comes with a dipping sauce; I went with the kimchi mayo, which complimented the fries very well. Another day, another smashed-and-griddled burger in Toronto. At some point, this city’s obsession with the thin, griddled patty (to the exclusion of every other type of burger) will cool down. Not that I’m complaining — well, not entirely, at least. Though a little more variety would be nice, there’s a reason this style of patty is so popular. It’s damn good. But there’s something to be said for the satisfying meatiness of a thicker patty, and for the smokiness that you get from the grill. I love chocolate cake, but other flavours of cake are good too, you know? But I digress. Extra burger is an especially bare-bones burger joint; the menu consists entirely of a cheeseburger, a double cheeseburger, and fries. They have a few stools where you can sit, but mostly, it’s take-out only. I ordered the double, which comes topped with lettuce, tomato, pickles, special sauce (well, they call it special sauce, but it looked and tasted like plain mayo to me), and two slices of American cheese. The burger certainly looks impressive; their griddling technique is exactly as it should be, with an impressive amount of dark brown crust on the exterior of each patty. And the burger is well proportioned and photogenic. Alas, though it’s a solid burger, it’s not quite as good as it looks. The well done patties are nicely juicy, but the beef is finely ground and overhandled, resulting in a burger that isn’t nearly as tender as it should be. It’s also bland; the meat has a very neutral flavour that, while certainly not unpleasant, lacks the beefy punch that you’re looking for in a top shelf hamburger. It’s otherwise very good — the gooey American cheese is perfect, the bun is soft and fresh, and the toppings are all on point (particularly the zippy, thickly cut pickle slices that I’m assuming they make in-house). As for the fries, they’re okay. They’re crinkle-cut, and they’re seasoned with a spice blend that brings them a nice flavour without overwhelming. But they were slightly underdone, with an unpleasantly chalky interior. 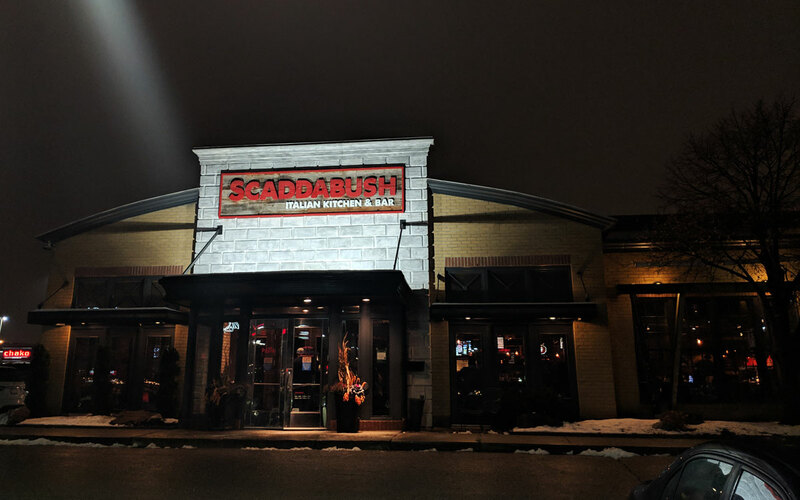 I’ve mentioned on another blog that Scaddabush is one of the better chains in Canada. That continues to be true. I even enjoyed the burger! Considering that my reaction to the hamburger at chains like this tends to range from “that was extremely mediocre” to “that was so bad it makes me angry,” I was shocked at how much I enjoyed what they served here. There’s so much going on here that the patty itself almost feels like an afterthought. Between the very garlicky pesto aioli, the sweet balsamic glaze, the peppery arugula, the chunky bruschetta topping, and the thick slice of fresh mozzarella, the beef is basically just another condiment. You could slide it right out and it would barely make a difference. I’m normally not a huge fan of over-condimented hamburgers, but it’s hard to deny that what they’re serving here is tasty. All of the toppings are quite good and compliment each other very well, and the substantial, slightly chewy bun does a great job of holding it all together. But what about the patty itself? It’s there, and it’s fine. The texture is slightly sausagey, and it doesn’t have a particularly beefy flavour (not that it makes a difference with all of the other stuff going on here), but it’s otherwise a solid burger patty. It basically just adds some meatiness — this thing is all about the toppings. As for the fries, they basically tasted like a lightly battered version of what they serve at McDonald’s. They’re not particularly great, but I’ve had worse. Here’s a complaint I’m pretty sure I’ve never made before: the burger at Gladiator Burger has too much beef. It’s too beefy. Is that even a thing? I feel like Peter in that episode of Family Guy where he lies about going to the doctor and claims he was told he was “in too good of shape.” That’s not a thing, is it? The menu says that the patties are six ounces each, but I wouldn’t be surprised if they were actually closer to eight. They’re enormous. I actually had a surprisingly hard time cutting it in half, because the burger was almost as tall as the plastic knife. The knife went about 80 percent of the way in. It was nuts. Too much beef or not, however: it’s a very good burger. The patties had a decent amount of crust from the griddle and a mild but satisfying beefy flavour. The texture was great; the grind was nice and coarse, and they weren’t too tightly packed. They were cooked all the way to well done, and I wish they were a little bit juicier, but they were quite good. They were top-notch patties. It’s clearly too much beef, though. It should have either been a single, or had two smaller patties. It’s good quality beef, but it would have needed to be phenomenal for me to want that much of it. It’s overwhelming. It’s the equivalent of ordering a triple (or a quadruple) at a regular burger joint. It’s excessive. Everything else was solid. The crispy beef bacon (which I’m pretty sure was deep fried) was satisfying, the cheddar was nice and melty (though American would have been preferable), and the griddled onions suit the burger perfectly. The Gladiator aioli was the standard tangy mayo. The bun was quite good as well, holding up nicely to the enormous burger without being too dense or substantial. I should reiterate that it was a really, really good burger; it’s easily the best burger in Mississauga, though that’s not exactly a tall mountain to climb. I just wish there were a little bit less of it. I won’t say that I was not entertained, but I could have been more entertained (what, did you think I was going to get through this whole review without a strained Gladiator reference? Come on). It’s also a bit pricey at almost twenty bucks for a combo — but then it’s like a pound of decent quality beef, so I guess the price makes sense. As for the fries, they had a mild stale oil flavour, but were otherwise really good. I often feel like a broken record writing burger reviews. I’ve written almost 200 of these things at this point, and there are only so many ways you can describe a hamburger before you start repeating yourself (and repeating yourself, and repeating yourself). Of course, the vast majority of people reading any given review will have popped in based on a Google search; they’ll read the review they came for, and that’s that. Those people have no idea how repetitive these reviews can be, which, oddly, makes me feel a little bit better about the whole thing. But if you’re one of the much smaller group of people who have read a bunch of these reviews… get ready for some greatest hits. These complaints are all going to seem pretty familiar. And yes, it’s mostly complaints, sadly. Though I’ve actually heard very good things about the burger at Portland Variety, the one I was served wasn’t particularly good. The main problem? The texture. The patty was way, way too finely ground and tightly packed (I’ve never made that complaint before, right guys??). It wasn’t too bad around the medium-well middle, but the well done edges were dry, dense, and chewy. It has that saltine effect, where you feel like you need to take a drink of water between each bite to prevent your mouth from completely drying out. Otherwise, the burger is either fine or slightly better than fine. Aside from the aforementioned issues, the patty was decent enough (if a bit too peppery), with a mild beefy flavour and a decent amount of juiciness (at least around the middle). If it weren’t for the fine grind and the dense texture, it would have been a solid burger. This would be the part of the review where I’d mention if it was griddled or grilled, but to be honest, despite the fact that it’s only been a few hours since I ate it, I’ve already forgotten. It wasn’t particularly memorable. As for the toppings, the pickles were fine, and the cheddar was probably a bit too strong, but it was melty and tasty. The “gherkin aioli” basically just tasted like a grainy mustard. It wasn’t bad — I generally find mustard a little overpowering on a burger, but this had a nice zing without getting in the way. The bun was great. It was easily the best part of the burger. It was soft and fresh, with the perfect amount of substance. The cassava fries were interesting. They were mostly quite tasty, with a very crispy exterior and a creamy, slightly chewy interior. But one of them featured a papery skin I couldn’t bite through, and the mayo-based dipping sauce was seriously bland, with a broken emulsion that made it unpleasantly greasy. I actually really liked Momofuku Daisho (including, of course, the burger, though their brunch was also quite delicious). 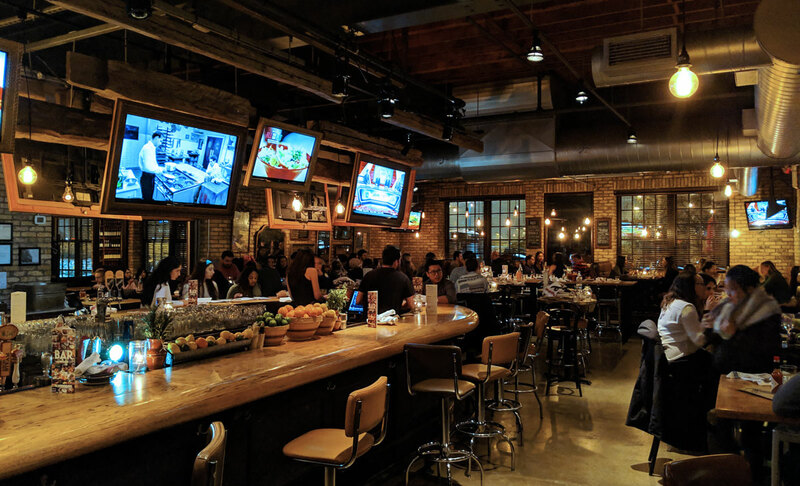 Alas, both it and the more upscale Shoto shut down earlier this year to make way for Kojin, which is essentially Momofuku’s take on a steakhouse. Considering how meat-based the menu is, I had very, very high hopes for their hamburger. And indeed, it is (almost) as delicious as you’d hope. Almost! But I have a few nitpicks, because I’m me so of course I have a few nitpicks. One of the bigger issues is obvious as soon as you take a look at the burger; it’s got these big, ridiculous Gruyere cheese wings. In theory, these things should be amazing. You can just snap them off and then eat them as a side dish, which is what I did. They’re like big fat cheese chips. They’re great. The problem is inside the burger. The cheese was obviously cooked separately from the patty and then placed on top after it had melted. So the whole thing is crispy, not just the edges. I shouldn’t even have to say this, but the cheese on a cheeseburger needs to be gooey and to melt into all of the crags and crevices of the patty. It shouldn’t be crunchy. That’s just… what is that?? Even worse: because of how much moisture there is inside the burger from the juicy patty and all of the sauce, the once-crispy cheese sogs up, and is actually more chewy than anything else. It’s weird and hard and wrong. I removed it altogether in the second half of my burger, and it came right off (which is how you know something is seriously amiss — the cheese and the patty should meld into one. They should be inseparable). The burger is also topped with pickles, braised onions, and garlic mayo. The toppings are mostly quite good, though the mayo is way stronger than it needs to be. It takes away from the amazing flavour of the beef. Because yes, the beef is pretty special. It’s cooked to a perfect rare, it’s extremely juicy, it has a great amount of crust from the griddle, and an intensely beefy flavour that’s beyond satisfying. It’s really obvious that they’re using great quality beef, because the flavour is spectacular. My only issue with the patty — and it’s a minor one — is that the grind is a little bit too coarse. I think it might even be hand-chopped rather than ground. 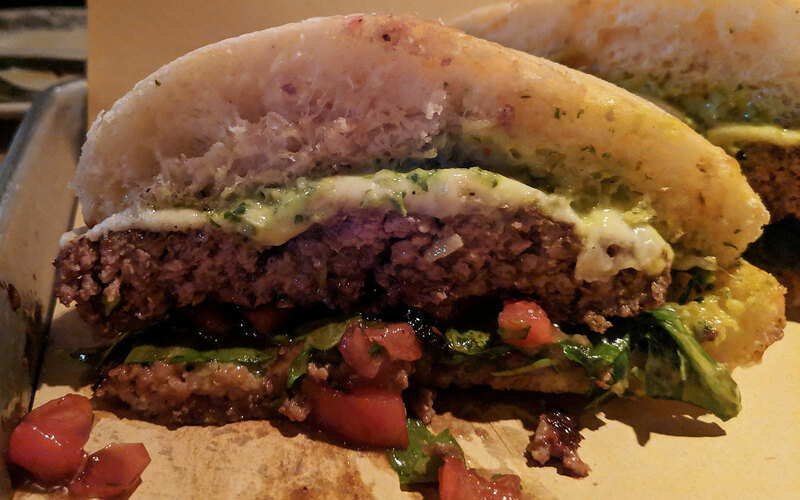 It’s certainly delicious, but it has a substantial, steaky chew; it comes dangerously close to tipping the scales from hamburger to steak sandwich. It never quite gets there, but it’s a tad closer than I’d like. I want my hamburger to taste like a hamburger. If I wanted a steak sandwich, I’d order a steak sandwich. Still, it’s so delicious that it’s hard to complain too much. I have a lot of little issues with the burger, but that patty is so damn good that they all just fade away. It’s amazing. Okay, one more complaint: the bun. It’s actually very good, but it’s quite soft and it just isn’t up to the task. The very juicy, saucy burger defeated it. By the last few bites it had pretty much disintegrated into mush. The burger clearly needs something with a bit more heft and sturdiness. It comes with a couple of enormous onion rings and ranch dipping sauce instead of fries. They’re not the best onion rings I’ve ever had, but they’re nicely cooked and tasty. Oh, also: it’s seriously expensive at 25 bucks. It doesn’t feel overpriced because of how amazing the beef is, but I think it needed to be mentioned. As much as I love the griddle-smashed burgers that are so omnipresent in the GTA, it’s hard to resist a big, fat grilled burger. But it’s much, much harder to find a really good burger cooked in that style, so when I heard that they serve a tasty one at The Belsize Public House, I was all over it. 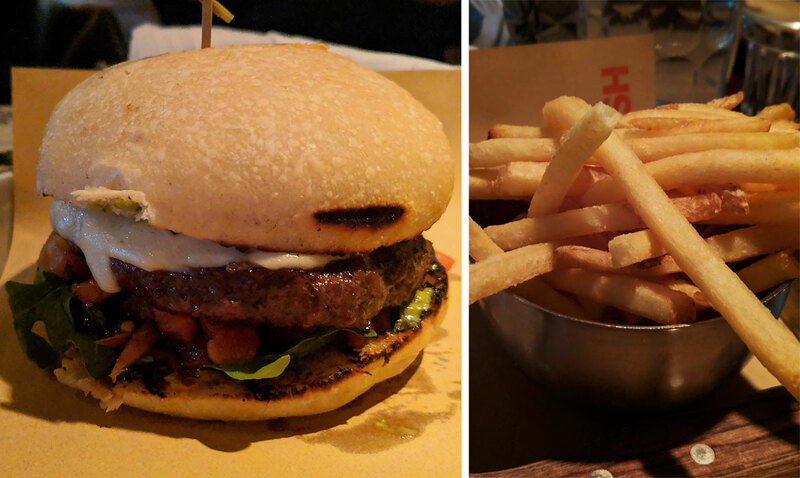 They have a couple of burgers on their menu; there’s the Hoser Burger, which features peameal bacon and cheddar, and the no-frills Grilled Burger, which comes topped with lettuce, tomato, and onion. As I’m wont to do, I went with the simpler of the two. I’ve cut through so many burgers over the years that I can pretty much tell instantly if a burger is going to be iffy. This one was suspiciously difficult to saw in half, and the alarm bells were going off in my head. They were screaming. As I feared, it wasn’t very good. The Belsize makes every mistake you can make to end up with an unsatisfying burger. Literally every single one: the beef was clearly too lean, the texture of the grind was way too fine, the beef had been overhandled and was too tightly packed, and it was cooked all the way to the tippy tippy top of well done (if not a little bit further). The meat was so dense. It was a punishingly tough chew. There was a vague amount of juiciness there, but not even close to enough to make any kind of impact. The flavour wasn’t much better; aside from the fact that I’m pretty sure they had mixed salt and pepper right into the patty (it was distractingly peppery), the flavour of the beef was almost non-existent. And what little flavour there was tasted vaguely off. It wasn’t good. I will say that my dining companion had the jerk pork sandwich and really enjoyed it, and the fries and the coleslaw that came with the burger were both quite tasty. The fries, in particular, were seriously delicious, with an addictively crispy exterior and perfectly creamy interior. So it’s possible that everything else coming out of the kitchen is tasty. But they bungled that burger, and they bungled it hard.